Outsource your payroll to us and stay on top of payroll tax regulations, improve compliance, worry-free tax filing and get payroll solutions tailored to your unique business needs. Centralized, simple and secure HR management solution that helps you structure & organize employee database, create workflows, manage tasks/checklists and much more. Bid goodbye to spreadsheets and documents! Quickly sift through the information what you need, the moment you need it. 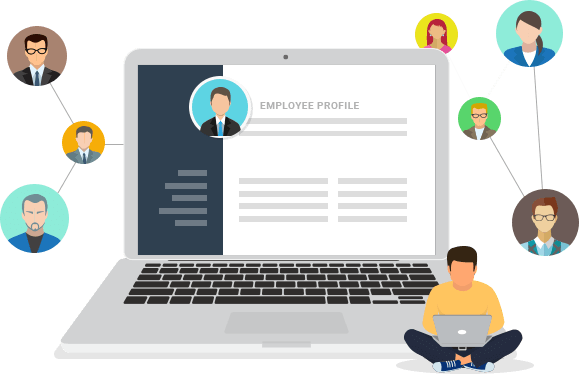 Manage all employee information such as joining date, personal contacts, as well as the basic details such as the date of birth, employee number, and addresses. Easy to create employee profiles with a click of a button. Quickly add, remove or update personal information like address, phone numbers, department, designation, reporting manager. Maintain all necessary details related to the employee's qualifications, year of passing, degree, etc. Revolutionize the way work is carried out with HR-One. 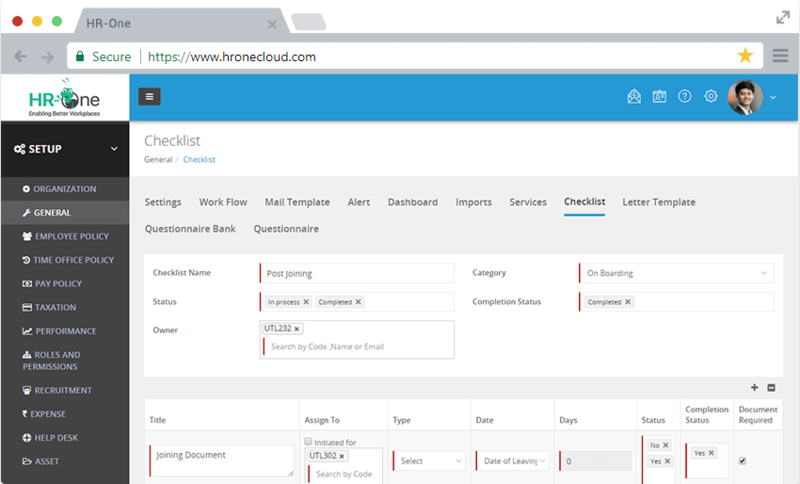 Extremely useful for HR personnel to upload employee documents safely. Dynamically view all your employees’ documents at a glance, get a more detailed view, and apply filters to refine your search by location, department, or employment status. Define policies and assign roles and permissions according to grades, roles, and departments. Different workflows can be set to meet varied department and location requirements. Auto initiate the process of confirmation. After the reporting manager confirms and verifies, the user gets notified of his or her confirmation in the organization. Easily manage transfers of an employee from one job, section, department, shift, plant or position to another at the same or another place with HR-One HRMS. Say goodbye on a high note and ease the exit process for both the HR personnel and the employee with HR-One HRMS software. Take your exit management to a higher level of ease. Easy to configure exit checklist and exit interviews. The employee can fill the exit questionnaire and a report is generated and filed under an employee profile. Instantly generate important payroll figures for net payable and receivables. Important payroll information like payables against salary, yearly bonus unpaid salary, non-availed leaves, LTA, medical, gratuity, notice period recovery and severance payout will be available to you in seconds. Initiate upto 40+ unique requests with HR-One. Quickly look through the information like leave, attendance, new hires, policies and announcements. 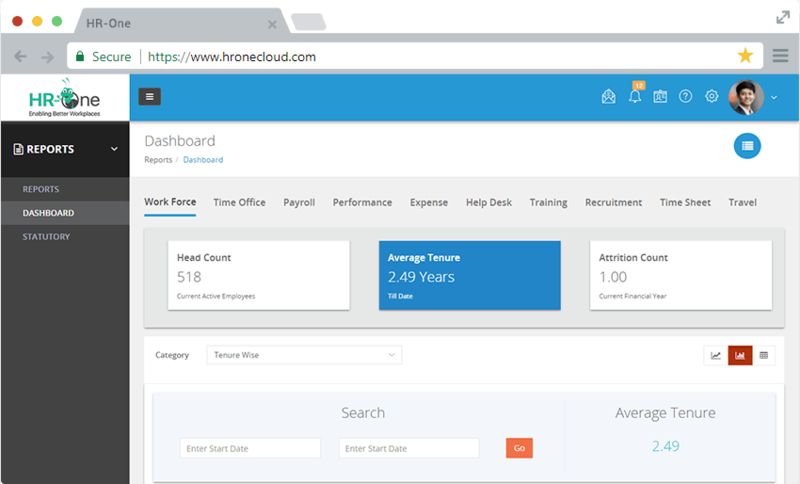 Or, use HR-One dashboard to download salary slips, Form 16, view incentive program, kudos and much more. Empower employees to raise tickets to the respective departments through the workforce management software. From IT related problems to booking of meeting rooms, all can be addressed via tickets and ticket owner can approve and close the ticket accordingly. 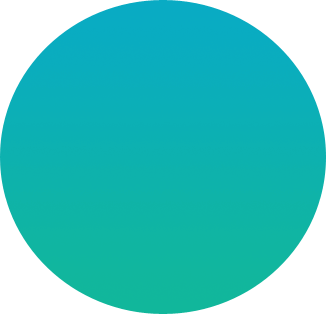 Search employees and access all information about your team members, have control on approvals, leave attendance, time-off scheduling, and more - all from a single dashboard. Clearly illustrates the reporting hierarchical structure of your company, team or department. Easily create detailed charts of only one department or your entire organization. Create a comprehensive checklist for onboarding, clearance and BGV. Save hours of the new hire and conduct all the pre-joining and post-joining formalities with no hassles. Manage day to day tasks of your team members without getting bogged down in paperwork. You can now assign and manage tasks of all of your employees in one system. Easy to customize dashboards for different functions, regions and departments as per your unique business requirement. Adjust the policies as per the specific needs and get customized dashboards graphically or any other form. Effortlessly publish latest announcements and policies from HR-One. Easy to create, update and publish, HR-One software can ease out your work to a great extent. Ease your workload by automating the process to publish birthdays, kudos, achievements, new hires and holiday calendar. Let new hires feel instantly connected with these updated facts. Engage your employees to the best as you run employee referrals. Simplify the task of HR personnel and bring the best hire on-board with referrals. Simplify the workload of HR personnel with set templates. With just a click of a button, you can create letter offer, probation, confirmation, resignation, and settlement letters with a set template. Avoid any hassle of creating letters when you can create and publish them in a go. With this module, instantly generate and publish offer, probation, confirmation, resignation, and settlement letters. Effortlessly manage and track comprehensive needs of employees with workforce management software. With enterprise-ready software, you can manage and track employee’s needs and their schedules seamlessly and foster a more conducive work environment. As one of the best workforce management solutions, you can manage end-to-end requirements for today’s modern workforce. Leave aside your legacy spreadsheets and piles of paper with this intuitive, integrated and user-friendly software. Stay organized and save tons of time and efforts on tedious workforce tasks. Invest in a robust HR-One software to improve processes and empower today’s workforce with totally dependable solution. Copyright © 2018 Uneecops Workplace Solutions Pvt. Ltd. All Rights Reserved.